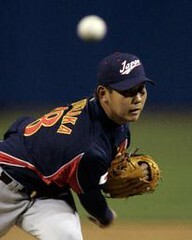 MKT's diary and life in Japan: WBC : Japan,the first WBC Champion! This is a blog writen by a Japanese guy living in Tokyo.His life is kinda unsual.Got a foreign(Dutch) wife(Not common here).Love to speaking English and hang out. Hope you guys enjoy! This is a Flickr badge showing public photos from hypermkt. Make your own badge here. WBC : Japan,the first WBC Champion! Japan did it! Japan beats Cuba,the most strongest baseball country!YAYYYYYYYYYYYYYY!!!!! I really appreciate this WBC.I wasn't interested in baseball anything at all.I haven't watched any games here.According to the TV reporter Japan has been started playing the baseball 50 years behind from the US.Japan was folling the US.But Finally We could! But Korea was also strong.They could improve how strong they are. Why would we want to do that? lol. because its getting annoying and just an sports game. Whats so important to make a fuzz about it all? Ok they are winners and i am happy for it ofcourse, but there are more important things to look at. <.< Speed skating, soccer, etc. are just games but Dutch people seem to go crazy about it to the point of wearing nothing but orange. so? what has that to do with the WBC? After the games, stop that and go back to their normal lives. And they do not only cheer for the Netherlands, als for other countries and when something bad happens. but i dont see what that has to do with this? <.< Because this is exciting and the very first one? thats still not an answer to my question. What has the dutch support to do with the WBC ? Because it's the support of baseball and the promotion of baseball on a intercontinental level? hey hey! calm down boys! yeah if the event is finished They go home and That's all.But I just enjoyed. Thanks for supporting and cheering Japan up! Anyway We enjoyed the game! and That is over now! alright? ^_^ we weren't really fighting were we? It's okay Makoto-kun we were just playing. its still not an answer. what has the dutch support to do with the WBC????? i still dont understand why did you say about the dutch support? ? ? It has the support part in common.